This article is about the geographic region. For other uses, see Karelia (disambiguation). Karelia (Karelian, Finnish, and Estonian: Karjala; Russian: Карелия, Karelija, historically Корела, Korjela; Swedish: Karelen), the land of the Karelian people, is an area in Northern Europe of historical significance for Finland, Russia, and Sweden. It is currently divided among the northwestern Russian Federation (the federal subjects of the Republic of Karelia and Leningrad Oblast) and Finland (the regions of South Karelia and North Karelia). Parts of Karelia, as they are divided today. Various subdivisions may be called Karelia. Finnish Karelia was a historical province of Finland, and is now divided between Finland and Russia, often called just Karjala in Finnish. The eastern part of this chiefly Lutheran area was ceded to Russia after the Winter War of 1939–40. The Republic of Karelia is a Russian federal subject, including the so-called East Karelia with a chiefly Russian Orthodox population. Within present-day Finland, Karjala refers to the regions of South and North Karelia, although parts of historical Karelia also lies within the region of Kymenlaakso (Miehikkälä and Virolahti), Northern Savonia (Kaavi, Rautavaara and Säyneinen) and Southern Savonia (Mäntyharju). Karelia stretches from the White Sea coast to the Gulf of Finland. It contains the two largest lakes in Europe, Lake Ladoga and Lake Onega. The Karelian Isthmus is located between the Gulf of Finland and Lake Ladoga. The border between Karelia and Ingria, the land of the closely related Ingrian people, had originally been the Neva River itself but later on it was moved northward into Karelian isthmus to follow the Sestra River (Russian: Сестра), today in the Saint Petersburg metropolitan area, but in 1812–1940 the Russo-Finnish border. On the other side of Lake Ladoga, the River Svir is usually thought of as the traditional southern border of Karelian territory, as Lake Saimaa marks the Western border while Lake Onega and the White Sea mark the Eastern border. In the North lived the nomadic Samis, but there were no natural border except for large wooded areas (taiga) and the tundra. In historical texts Karelia is sometimes divided into East Karelia and West Karelia, which are also called Russian Karelia and Finnish Karelia respectively. The area to the north of Lake Ladoga which belonged to Finland before World War II is called Ladoga Karelia, and the parishes on the old pre-war border are sometimes called Border Karelia. White Sea Karelia (sometimes the Finnish or Karelian term "Viena Karelia", or in some English-language sources, "White Karelia", is used) is the northern part of East Karelia and Olonets Karelia is the southern part. Tver Karelia denotes the villages in the Tver Oblast that are inhabited by Tver Karelians. Karelia was bitterly fought over by Sweden and the Novgorod Republic for a period starting in the 13th-century Swedish-Novgorodian Wars. The Treaty of Nöteborg (Finnish: Pähkinäsaaren rauha) in 1323 divided Karelia between the two. Viborg (Finnish: Viipuri) became the capital of the new Swedish province. In the Treaty of Stolbovo in 1617 large parts of Russian Karelia were ceded to Sweden. Conflicts between the new Swedish rulers and the indigenous population of these areas led to an exodus: thousands of Karelians, including the ancestors of the Tver Karelians, emigrated to Russia. The Treaty of Nystad (Finnish: Uudenkaupungin rauha) in 1721 between Imperial Russia and Sweden ceded most of Karelia to Russia. The Treaty of Åbo in 1743 between Sweden and Russia then ceded South Karelia to Russia. After Finland had been occupied by Russia in the Finnish War, parts of the ceded provinces (Old Finland) were incorporated into the Grand Duchy of Finland. In 1917, Finland became independent and the border was confirmed by the Treaty of Tartu in 1920. 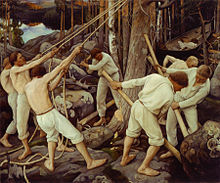 Finnish partisans were involved in attempts to overthrow the Bolshevists in Russian Karelia (East Karelia) in 1918–20, such as in the failed Aunus expedition. They also wanted to incorporate the rest of Karelia into Finland and cooperated with the short-lived Republic of Uhtua. These mainly private expeditions ended after the peace treaty of Tartu. After the end of the Russian Civil War and the establishment of the Soviet Union in 1922, the Russian part of Karelia became the Karelian Autonomous republic of the Soviet Union (ASSR) in 1923. In 1939, The Soviet Union attacked Finland, thus starting the Winter War. The Moscow Peace Treaty of 1940 handed most of Finnish Karelia to the Soviet Union. About 400,000 people, virtually the whole population, had to be relocated within Finland. In 1941, Karelia was liberated for three years during the Continuation War of 1941 to 1944 when East Karelia was occupied by the Finns. The Winter War and the resulting Soviet expansion caused considerable bitterness in Finland, which lost its second biggest city, Viipuri, its industrial heartland along the river Vuoksi, the Saimaa canal that connected central Finland to the Gulf of Finland, access to the fishing waters of Lake Ladoga (Finnish: Laatokka), and made an eighth of her citizens refugees with no chance of return. From the areas ceded to the Soviet Union, the whole population was evacuated and resettled in other parts of Finland. The present inhabitants of the former Finnish Karelian parts of Russia, such as the city of Vyborg/Viipuri and the Karelian Isthmus, are post-war immigrants and their descendants. As a consequence of the peace treaty, the Karelian ASSR was incorporated with the Karelo-Finnish SSR 1941–1956, after which it became an ASSR again. Karelia was the only Soviet republic that was "demoted" from an SSR to an ASSR within the Russian SFSR. Unlike administrative republics, Soviet republics (in theory) had the constitutional right to secede. The possible fear of secession, as well as the Russian ethnic minority in Karelia, may have resulted in its "demotion." In 1991 the Republic of Karelia was created out of the ASSR. The collapse of the Soviet Union brought an economic collapse. Since the dissolution of the Soviet Union, the area has experienced massive urban decay. The hastily and poorly constructed buildings from the Soviet era, as well as older houses remaining from the Finnish era, are being abandoned. Karelia is politically divided between Finland and Russia. The Republic of Karelia is a federal subject of Russia, which was formed in 1991 from the Karelian ASSR. The Karelian Isthmus belongs to the Leningrad Oblast. The Finnish side consists of parts of the regions (maakunta) of South Karelia, North Karelia and Kymenlaakso. There are some small but enthusiastic groups of Finns campaigning for closer ties between Finland and Karelia. The political expression of these irredentist hopes is called the Karelian question and is about Finland's re-acquisition of the ceded Finnish Karelia. These hopes live on, for instance, in the Karjalan Liitto and ProKarelia. However, ambitions for closer ties with East Karelia do not include territorial demands. The Russian side is mostly Russian-speaking. However, there are minorities speaking Finnish or closely related Finnic languages. Finnish has had varying recognition in Russian Karelia throughout history. The closely related Karelian language is spoken in the Republic of Karelia and in the Karelian villages of the Tver Region of Northwest Russia. The more distantly related Veps language is spoken on both sides of the River Svir. Ingrian Finnish dialects are spoken in Ingria, which is an area around St. Petersburg, between the Estonian border and Lake Ladoga. Ingrian Finns settled in the region in the 17th century after the Swedish conquest of the area. The settlers spoke Karelian and Savonian dialects of Finnish. The older inhabitants of the Ingria, the Ingrians, have their own language which is related to the Karelian language and the south-eastern dialects of Finnish. Karelians who evacuated from Finnish Karelia resettled all over Finland and today approximately one million people in Finland can trace their roots in the area ceded to the Soviet Union after World War II. In Finland, about 5,000 people speak Karelian. Karelia is a regular destination among Finnish and Russian territories in international tourism for its unique architectural, cultural and historical sites such as Kizhi and Valaam. The region is worth a trip in both summer and winter when possible activities include riding in a sled behind a dog team and running from the banya to an ice hole and back. Summer hikers can visit the Kivach waterfall or the Demon's Chair plateau. Karelia Suite, a collection of pieces by the composer Jean Sibelius. Asbestos-ceramic, a type of pottery made in Karelia and vicinity. Karelianism, a cultural movement in the Grand Duchy of Finland. The band Mastodon, who pay homage to Karelia on their album Crack the Skye with the song "Ghost of Karelia". Viipurin Lauluveikot, a Finnish men's choir founded 1897 in Viipuri, Finnish Karelia. The Karelian Isthmus is the debut album of Finnish metal band Amorphis, released in 1993. Lauri Törni, born in Viipuri, a soldier and recipient of the Mannerheim Cross during the Continuation War, who later served with the German and American armies. ^ VSEVOLOD, PULYA. "Karelia will return in your dreams". Russia Beyond the Headlines. "They Took My Father," by Mayme Sevander and Laurie Hertzel, a history of Finnish Americans who emigrated to Soviet Karelia during the Great Depression. 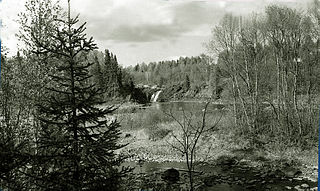 Wikimedia Commons has media related to Karelia. Karelia will return in your dreams Article about Karelia with photos and useful tourist information. The Karelo-Finnish Soviet Socialist Republic, also called Soviet Karelia or simply known as Karelia, was a republic of the Soviet Union. It existed from 1940 until it was made part of the Russian SFSR in 1956 as the Karelian Autonomous Soviet Socialist Republic. The latter became the Republic of Karelia, a federal subject of Russia, on November 13, 1991. Sortavala is a town in the Republic of Karelia, Russia, located at the northern tip of Lake Ladoga near the Finnish border. Population: 19,235 (2010 Census); 21,131 (2002 Census); 22,579 (1989 Census). The Karelian question or Karelian issue is a dispute in Finnish politics over whether or not to try to regain control over Finnish Karelia and other territories ceded to the Soviet Union in the Winter War and the Continuation War. Despite the name "Karelian question", the term may refer also to the return of Petsamo, ceded parts of Salla and Kuusamo, and four islands in the Gulf of Finland. Sometimes the phrase "debate on the return of the ceded territories" is used. The Karelian question remains a matter of public debate rather than a political issue. 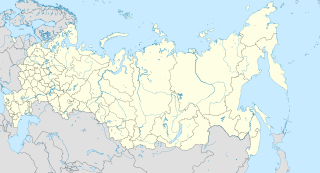 Vyborgsky District is an administrative and municipal district (raion), one of the seventeen in Leningrad Oblast, Russia. It is located in the northwest of the oblast on the Karelian Isthmus and borders with Priozersky District in the northeast, Vsevolozhsky District in the east, Kurortny District of the federal city of St. Petersburg in the south, Kymenlaakso and South Karelia regions of Finland in the northwest, and Lakhdenpokhsky District of the Republic of Karelia in the north. From the southwest, the district is limited by the Gulf of Finland. The area of the district is 7,475.472 square kilometers (2,886.296 sq mi). Its administrative center is the town of Vyborg. Population : 120,446 (2010 Census); 113,748 ; 108,571 (1989 Census). The old Karelian railroad between Viipuri (Viborg) and Joensuu is a railway with 1,524 mm broad gauge, which used to link Joensuu, Sortavala, Hiitola, Antrea and Viipuri (Vyborg). Originally built in 1892-1894 by Finnish State Railways in the Grand Duchy of Finland, in the 1940s most of the railway up to Niirala was ceded by Finland to the Soviet Union in the Moscow Peace Treaty, Moscow Armistice and Paris Peace Treaty as a result of the Winter War and Continuation War. Now the track is located in Leningrad Oblast, Republic of Karelia and North Karelia. The Sortavala – Joensuu link across the border was abolished after the Continuation War, but was since restored and is currently in use for cargo traffic. Deportations of the Ingrian Finns were a series of mass deportations of the Ingrian Finnish population by Soviet authorities. Deportations took place from the late 1920s to the end of World War II.